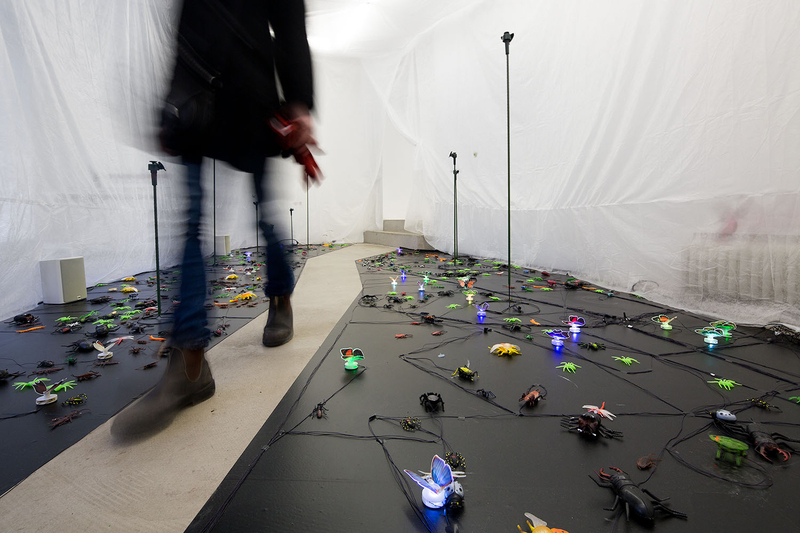 The piece consists of toy insects that are both inanimate and robotic, and a 12 min soundscape that is composed of insect themed horror films. The toys are placed on top of a black plastic oval shape that has a form of walking path in its midst. There is a protective white tent around the area with two openings that are placed at the ends of the walking path. Often, when describing something that we think to be as it should be, we say that it is natural.The term is used as an description from food substances to holiday resorts. It is used to justify our bodily functions and actions. This very versatile term is used in so many ways when referring to something wholesome, good and becoming that it seems to be come an all encompassing concept. Even the most contradictory meaning manage to fit under this term. When things are named opposite, unnatural, they are deemed to be repulsed and feared. It is our last refuge when nothing else can be used to condemn an action, a quality or a thing. When we don’t know why we hate and fear we use unnatural. So natural and unnatural are a pair of those words we can use to reflect the dichotomy of modern existence on. Whenever we spot them in a discussion about human condition, social structures or behavior we have to stop and think what they actually represent and replace. What lies underneath the natural.